The Trabant is a small car built by the Nationalized Auto Industry in East Germany. 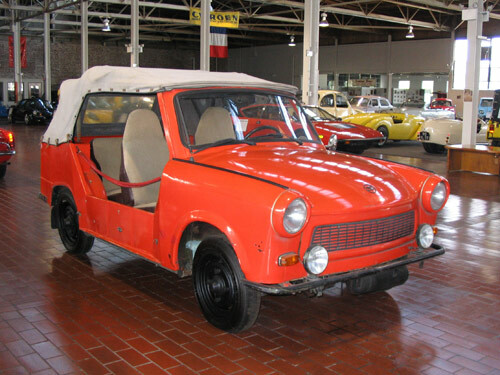 In the late 1950s, this vehicle emerged and became the symbol of Eastern transportation--the Trabant. When cheap transportation was all the rage throughout Europe, the Trabant was the perfect means of transportation for the whole family with a little trunk in the back. Its downfall seemed to be that very few changes were made to the Trabant in its 33-year life. Everything about the car is essentially the same as when the car was introduced in 1958. 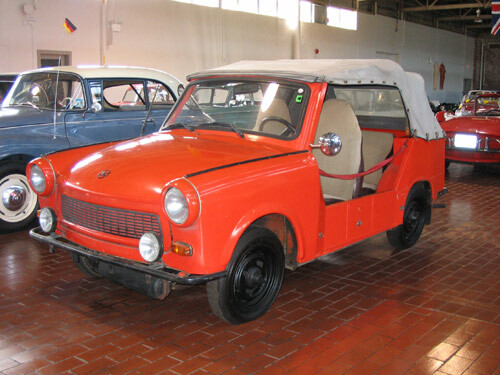 When the Berlin wall fell, the days for Trabant were numbered. The body is made of varied agricultural wastes and plastic resins called Duraplast, and was considered an inexpensive substitute for fiberglass. Many were discarded when Germany reunified, and consequently are now collector’s items. Several may be seen in the lobby of the Rock and Roll Hall of Fame in Cleveland, as used by Pink Floyd during “The Wall” tour.